Exactly two months ago, my family and I set out to plant our garden with Pop Pop. It’s our annual kick off to summer ritual. Based on past experiences, we thought we were being very wise in that we only planted what we suspected we’d use, not what sounded good at the plant store. We had a grand time and talked about the different MyJudytheFoodie dishes we could cook with the variety of vegetables and herbs. In the end, our little garden-that-could, the meager 6×8 foot plot of land with partial sunlight and a crude chicken wire fence, looked gorgeous and ready for a summer of sunlight and homegrown love. 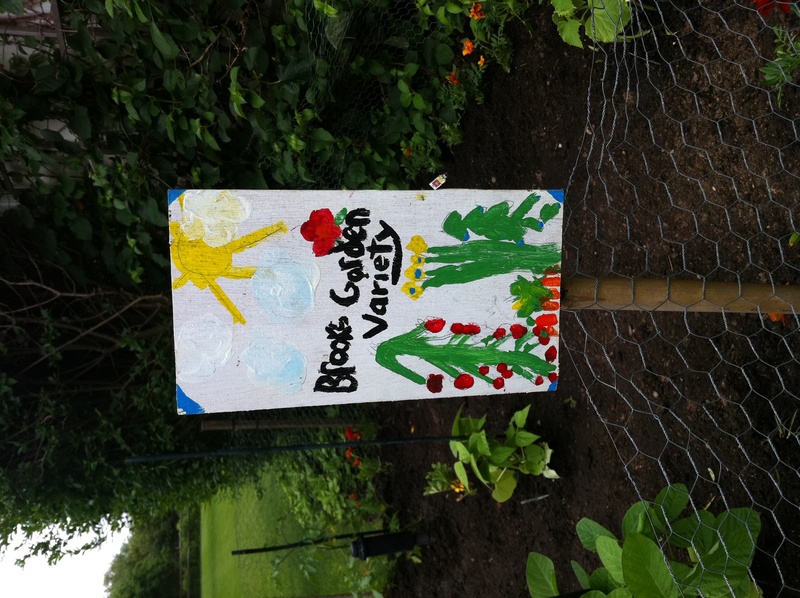 The first few weeks, my son and I took pride in watering the garden patch. It’s easy enough and, we simply could not wait to see which plant would yield first. Shortly thereafter, as expected, my son lost interest in the daily maintenance. Maybe it’s because he got more excitement watering the flowers with the cool nozzle that had superpower settings like, “spray” and “full” and “shower.” The garden is much more work as we have to lug over an unwieldy watering can that’s way to hard to pick up. Regardless, the garden started suffering from neglect. And my son wasn’t the only one to blame. 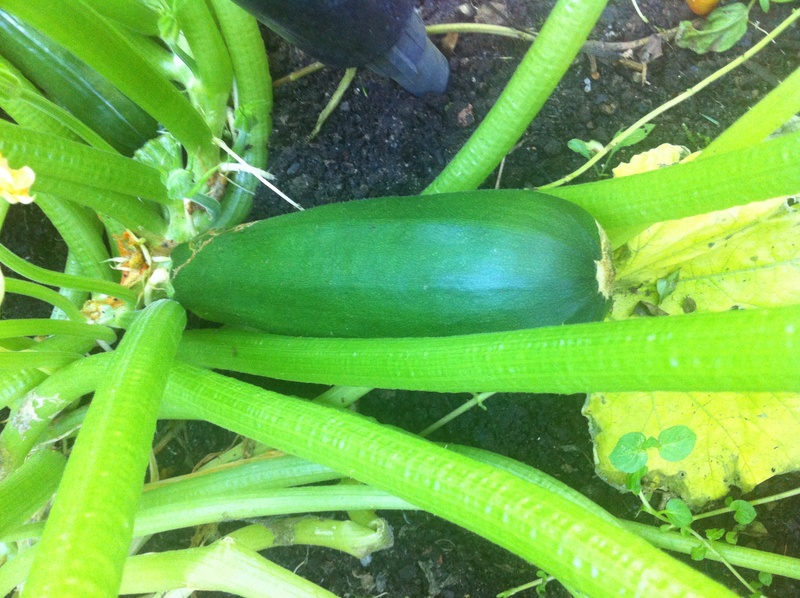 I too became disenchanted when I realized that we should never have planted a zucchini plant in an 8×6 plot. 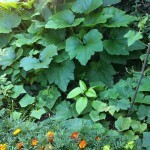 Two weeks into the garden and the zucchini plant grew elephant leaves that eclipsed everything around it – blocking any remaining sun! Feeling defeated (and ashamed to show anyone the garden), we resigned ourselves to the fact that we “screwed up” a bit this summer with regards to garden spacing. 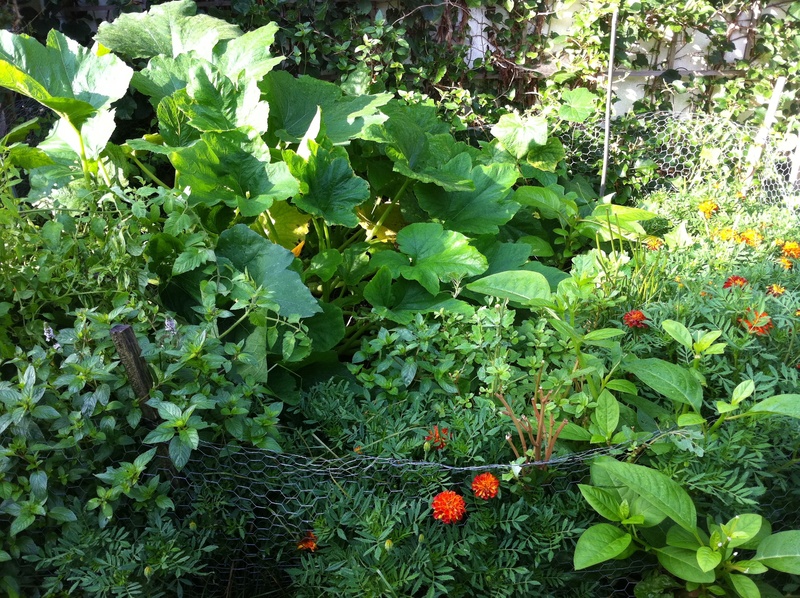 The mint took over like a weed and even grew outside the chicken wire and even started creeping towards the swing set. The cherry tomato plant grew soo tall that it immediately fell over due to the weight of its limbs (we needed a metal casing but, too little too late). 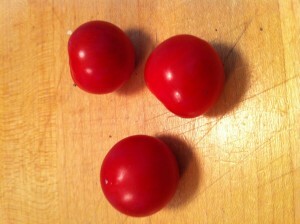 It only produced the sad little red tomatoes. The rest of the tomatoes never got enough sun or feel to the grown. Yup. These are the only tomatoes we've gotten ALL summer. The string bean plant was very prolific in the beginning but then, slowed down and eventually gave up. The basil plant grew lovely fresh leaves – enough for many jars of Mom’s pesto—that is until the zucchini leaves took over and within a week, everything shriveled up. The cucumber plant yielded 3 ripe, plump prickly cucumbers (which we used for Mom’s cucumber soup). I’m fairly certain the next batch was eaten by the rabbits. And, the darn zucchini plant did nothing but reek havoc on everything around it in the garden. Yielding NOT ONE zucchini. But, this morning, as we were waiting for the camp bus, we decided to give the garden some love (because it looked so overgrown and sad). As I was moving some of the leaves around (and cursing under my breath), I was startled when I literally stumbled upon two of the most enormous, hard, ripe, phallic looking zucchinis I have ever seen. We screamed and cheered and ran into the house to cut them and to celebrate! 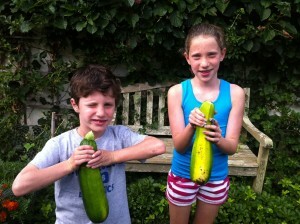 Kids holding up our zucchinis with pride! We all learned a lesson this morning. Never give up. 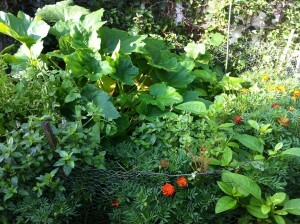 We considered the garden somewhat of a lost cause when, in reality, we had cooked with almost everything we had planted. Ok, it certainly wasn’t pretty but, guess what? It was organic and homegrown! In our yard! With our hands and nothing else. 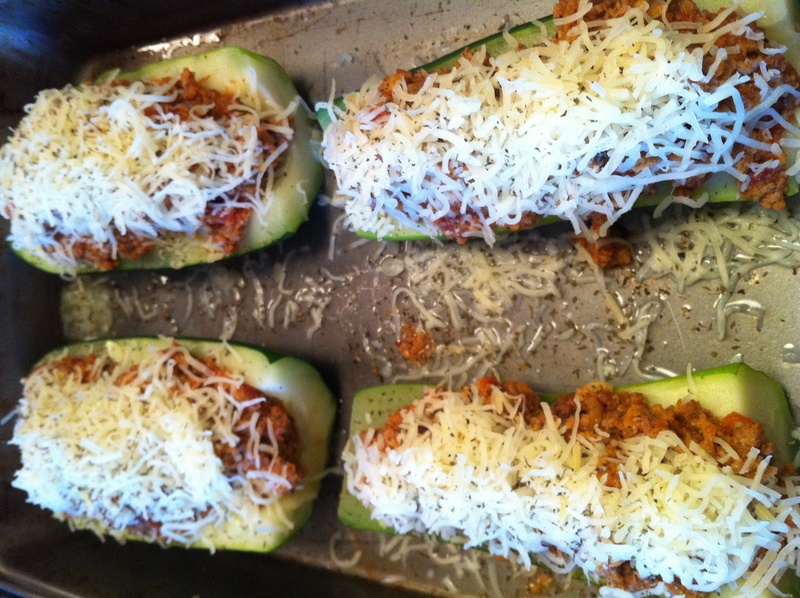 And, the best was yet to come: Stuffed Zucchini with Meat Sauce for Dinner! Steam zucchini and scoop out the insides with a spoon when steamed thoroughly (save the innards in a bowl). Brown ground meat on medium heat in skillet. Drain excess water. Place meat back in skillet with 1 tablespoon olive oil and Worcestershire sauce, onions, zucchini innards and garlic. 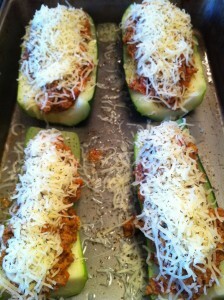 Add in inside of zucchini to meat mixture. Layer in tomato sauce and bread crumbs. 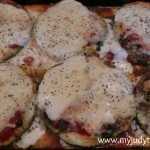 Remove mixture from stove and add in to scooped out zucchini boats. Sprinkle tops with cheddar cheese…salt and pepper. Hooray! I think you can share all your gardening lessons with us. Few people would know how to plan a garden the first time. What a nice surprise. I love your admission that you lose interest. Who hasn’t started a project and found themselves distracted.